TORONTO, ON, December 13, 2016 – Today TOYOTA GAZOO Racing launched the Toyota Yaris WRC and presented its driver line-up for the 2017 season. With the start of the 2017 FIA World Rally Championship (WRC) in Monte-Carlo, Monaco just over a month away, TOYOTA GAZOO Racing WRC is putting the final touches on its preparations for an event that the team has eagerly awaited. Thousands of hours in the workshop, testing program and a great deal of teamwork have filled the days of TOYOTA GAZOO Racing WRC for more than a year. Everything has been focused on a single goal: being ready at the start of the Rally Monte-Carlo. Participating in WRC, which is the pinnacle of rallying, will definitely provide Toyota with new challenges and opportunities to further develop its people, explore new technologies, and experience various road conditions around the world, thereby contributing to making “ever-better cars”. When I attended the WRC in Finland in July 2014 as a spectator, many fans asked when Toyota would be returning to the rally. Six months later, we decided to return to WRC, and today it is my great pleasure to present the car to compete in WRC, with our team members who have prepared for it and the partners who have supported us in that effort. I was extremely surprised and delighted that even after more than 10years, many people remembered that once Toyota competed in WRC. First, I would like to express my gratitude to, and respect for, the those fans who waited 17 years for this day and also all the rally organizers, participants and automakers who have safeguarded and furthered the sport of rally during our absence.T hanks to all of you, we’re back here. At the same time, I’d like to take this opportunity to express my respect for everyone who created a strong bond between rally and Toyota and etched that bond into people’s memory, including the late Ove Andersson, who launched Toyota’s team in the 1970s and led since then; the late Björn Waldegård, who catapulted Toyota to fame in WRC in the 1980s; and Carlos Sainz, Juha Kankkunen, and Didier Auriol, who captured drivers’ championships for Toyota in the 1990s. Because they involve competition on all types of roads, rallies are the optimal stage on which to hone the capabilities of both people and cars. Toyota has not been seen on that stage for a long time, but I’m truly happy that we’re back. Both people and cars are trained and strengthen when they are exposed to conditions that exceed the imagination during competition. Tommi Mäkinen has won the WRC events numerous times, and he has the experience of competing in a variety of cars, including Mitsubishi and Subaru entries. Precisely because we understood that Tommi could give Toyota a variety of experiences that were unimaginable until now, we asked him to lead our car-and team-building effort. As I said after this year’s 24 Hours of Le Mans endurance race, TOYOTA GAZOO Racing “hates” to lose. Rest assured that the same attitude applies to WRC. The other day, I had the pleasure of sitting in the driver’s seat of our Yaris WRC and driving the car a few miles with Tommi. Perceiving the car’s sound and smell, the feel of the steering wheel and pedals, and, more than anything else, the look on Tommi’s face, I was able to share with him a feeling of confidence in our ability to compete with this car. We, including members from Finland, Germany, and Japan led by Tommi, will be doing our very best throughout this final month, right up until the WRC begins, so that we can—as quickly as possible—assure long-time fans that Toyota is back as the king of this kind of event and put smiles on old and new fans’ faces by affirming their choice to support our team. I hope that you’ll support TOYOTA GAZOO Racing, a team that hates losing more than anything else, as we compete in the WRC. The Yaris WRC has been developed complying with the requirements of the FIA technical regulations for the 2017 season, and itis part of the new generation of World Rally Cars that will add a new dimension to the sport’s top-flight category in upcoming seasons. Equipped with a 1.6-litre direct injection engine, it has 380 horsepower under the bonnet and impressive design thanks to the freedom allowed by the regulations in terms of aerodynamics. The Yaris WRC has been designed, built and developed by a team of experienced engineers made up of Tom Fowler, Simon Carrier and Mikko Ruoho. 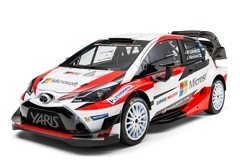 Two Yaris WRCs, driven by Jari-Matti Latvalaand and Juho Hänninen, will contest the opening round of the World Rally Championship in Monte-Carlo on 19 January of next year. Esapekka Lappi, Finnish young driver who won the WRC2 Championship this year, will also join the team through the season as a test driver. Since contesting his first WRC rally in 2002, Jari-Matti Latvalahas continued to impress and ended the 2016 season with 16 WRC wins to his name. With 169 starts under his belt and a three-time runner-up in the World Rally Championship alongside co-driver Miikka Anttila, Jari-Matti is without question one of the best drivers in WRC. His invaluable experience at this level and his level of performance will give the TOYOTA GAZOO Racing WRC team real impetus for the 2017 season. Juho Hänninen, who will be competing for TOYOTA GAZOO Racing WRC alongside co-driver Kaj Lindström, took part in the development of the Yaris WRC from its very first outing. His considerable WRC experience and his knowledge of the car will make him an undeniable asset for the team. Newly-crowned WRC2 World Rally Champion, the young Finnish driver has impressed with his turn of speed, his calmness and his ability to adapt. After cutting his teeth in R5 category cars in the European Rally Championship and developing his skills on the world stage in the WRC2 Championship, the Finnish driver is now ready to take on a new challenge. He will be appointed as test driver for the TOYOTA GAZOO Racing WRC team.